HP just reported a quarter that beat expectations. On a call with Wall Street analysts, HP’s CEO Meg Whitman compared the company to someone struck down with a illness. “The patient shows improvement,” she said. She said that despite the fact that year-over-year revenue declined in just about every segment. and Software revenue was down 2%. 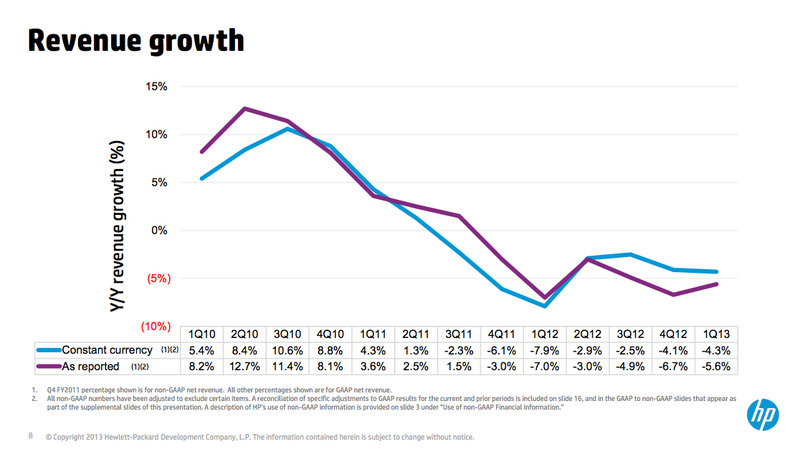 Only HP Financial Services, a tiny financing arm, saw revenue grow—at 1%. But these results are better than the brutal year-over-year revenue losses HP showed in the previous quarter. And HP is cutting costs and fixing its debt situation. That seems to be Whitman’s argument. Here’s the relevant chart shows the patient’s progress. You can see that the losses have stabilised.